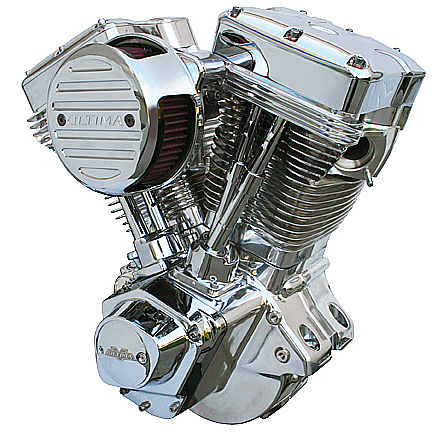 Ultima Polished El Bruto 100c.i Complete Engine for Harley Big Twin 1984-1999 . Ultima #298-252 100 C.I. Engine Polished Finish. Rated Output 100 C.I. 110 HP with 110 LB FT Torque.. Emphasizing longevity, Ultima El Bruto® engines combine high quality components. Our proven combinations deliver more horsepower and due to our exclusive balancing methods, we feel they are the smoothest engines on the market today. All castings are made from C355 aluminum, a common military alloy known for its stability over multiple heat cycles. The engine components are machined on state of the art CNC equipment for guaranteed dimensional accuracy and repeatability. Our customers agree these engines are the best value anywhere..